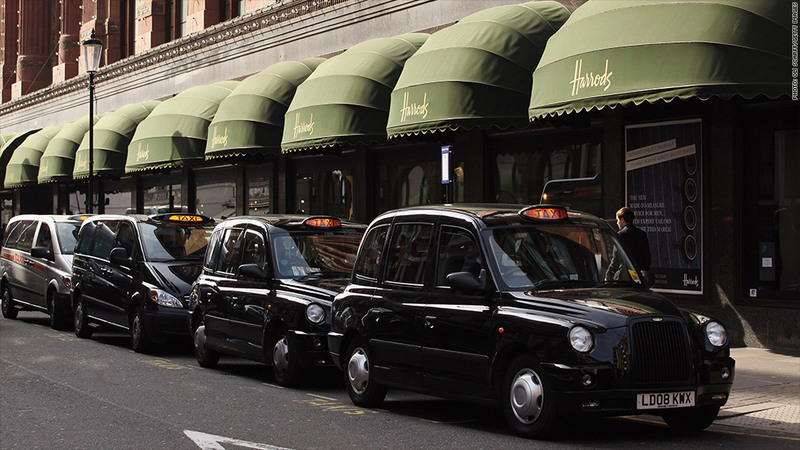 London taxis queue outside Harrods department store. The maker of the distinctive black cabs has called in insolvency administrators. London's taxi drivers are never lost for words. But they may be searching for a new vehicle supplier after the maker of the city's distinctive black cabs said it was calling in insolvency administrators. Manganese Bronze said it was appointing administrators after failing "to secure funding on acceptable terms to address the group's financial needs." London's black cabs have a monopoly on picking up passengers in the street. Rival mini-cab services have to be booked in advance. Manganese Bronze has been losing money for years, and its financial problems accelerated earlier this month after it was forced to recall about 400 of its TX4 London taxis and suspend sales of the new model due to a steering fault. It said at the time that the suspension of sales would have a "very material and detrimental impact" on the group's cash flow. Dealing with the recall would remain the top priority for the group while in administration, Manganese Bronze said. It added that it was hopeful "the fundamental strengths of the company, the TX4 model and its global reputation will provide the platform for a successful business in the future". Chinese carmaker Geely, which owns Sweden's Volvo, has a 20% stake in Manganese Bronze and together the companies produce taxis in Shanghai for export to world markets. Other major shareholders include Toscafund Asset Management, Landsdowne Partners and Henderson Global Investors.